Caitlyn’s new activity this year is book club. A local homeschool mom has organized a club for 4th-6th graders using the Arrow guides from Brave Writer. Caitlyn loves reading, and she was on board to give this a try. She was nervous about the first meeting, but I think she enjoyed it while she was there. She participated by answering questions, and responding to other kid’s thoughts on the book. The group also painted eye rocks, to keep or hide around town (because that is a thing right now). Caitlyn and I had a wonderful time reading the Wizard of Oz and doing all the activities I had planned to go along with it. We were blessed with a copy of the book and these incredible dolls to go along with the book from my parents. Caitlyn used the dolls to retell the story over and over again. She also explored tornadoes to go along with the book. She made a pastel picture and actual got her hands a little dirty doing it. She also made a cyclone in a bottle. It was hard to capture in a picture, but she enjoyed the experiment. We also followed the yellow brick road of the story, and did our first in depth character mapping. This was probably our favorite activity and I love how well it turned out. Caitlyn thought painting the poppies with celery and pom poms was funny (she just didn’t like the smell of the celery). When we finished the book we watched the movie and completed a comparison contrast of the two. We both loved reading this book together for the first time, and Caitlyn also loves the movie and has watched over and over again. I have a lot of goals and ambitions for this academic year, however my primary goal is to help Caitlyn be a more confident and ravenous reader. So we are increasing our reading plan this year. Caitlyn will have required independent reading each day and those books will be of her choosing. 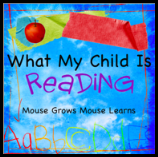 We will be going through How to Teach Your Child to Read in 100 Easy Lessons to reinforce her skills. I picked the following books either based on history tie in, grade level or other recommendations. I will read these aloud or we will listen to an audio book. It is an ambitious list, but I think we can do it. So, if you are looking for either of us this year we will be the girls with our heads buried in one book or another. I saw this idea on Pinterest and I knew that Cricket would absolutely love it, so I set out to collect and wrap 24 Christmas books for an Advent countdown. I ended up with 28 books somehow so we started early, and she has been opening one each day. This has been a huge hit so far, and we have both really enjoyed the variety of books. I chose not to number them so that she could pick whatever she wanted to open each day. I did write the title on the back of each package so that if she asked about a specific book I could find it. Dora’s Counting Christmas – This is a simple countdown style book with a Dora theme. Cricket liked the Christmas items in the book, and of course Dora and Boots. The Berenstain Bears Meet Santa Bear – Cricket loves her Berenstain Bear books and this was no exception. I liked the “Joy of Giving” focus, but I’m struggling with balancing the Santa stuff. A Very Minty Christmas – This was a My Little Pony board book. It had a basic countdown theme going through the book as well as a find the stockings theme. Cricket seemed to enjoy it overall. The Animals’ Christmas Eve – Cricket loved this one, I think again because it focused on animals. This book also offered a basic counting lesson. I really liked that the animals were telling the story of the birth of Jesus, and the real reason for the season. The Christmas Story – This is the closest story I have found to reading the actual nativity story out of the bible. Cricket was familiar with the terms and story from our Truth in Tinsel studies this year, and she enjoyed the pictures. A Child Was Born: A First Nativity Book – This book is probably best suited for a preschooler, the story is very simplified. Cricket wasn’t very drawn in by this one, but I liked it’s illustrations. Elmo’s Squeaky Santa – This was a Target Dollar Spot find from last year. I’m seeing a theme here! This was a simple little Christmas book light on content and meaning. Alabaster’s Song – Cricket was not interested in this book by looking at the cover, but I convinced her to let me read it anyway. That was a good thing, since she really enjoyed the book. I think it was nice to have something “magical” about Christmas that was still Christ focused. A Christmas Prayer – I reviewed this book last year for Thomas Nelson, and I still really love it. It is a great companion to our Truth in Tinsel activities. It is a wonderful retelling of the Christmas story in children’s words and terms. The Story of Christmas – I think this is my favorite Christmas Nativity book so far. It just does such a good job of telling THE story of Christmas to a child. I’m so happy Mimi added this one to our collection. The Nutcracker – This is an old children’s version of the classic tale from my childhood. Cricket wasn’t so sure about this at first, but she ended up liking all the dancing in it. She has been really interested in my nutcracker collection since reading it too. The Golden Christmas Tree – Cricket loved this book, because it had all of her favorite animals in it. She loved reading about the animals Christmas celebration, and I would recommend it to any little animal lovers. The Penguin Who Wanted to Be Different – A Christmas Wish – This was a cute twist on a Santa style Christmas story. We both loved that it was all about penguins, a favorite in our house. I saw this idea on Pinterest and I knew that Cricket would absolutely love it, so I set out to collect and wrap 24 Christmas books for an Advent countdown. I ended up with 28 books somehow so we started early, and she will open one each day through Christmas Eve. 12 Days of Christmas – This was a Target Dollar Spot find, and she loved it when I “sang” the book to her. She has enjoyed looking through it on her own, and it’s simple enough that she can somewhat read it independently. Peanuts Color & Read Along Snow Day – Cricket has enjoyed having a book that she CAN color in since this is normally a big no no. This was another Dollar Spot find. The Poky Little Puppy’s First Christmas – The Poky Little Puppy was one of my favorite books as a child, and my mom got this for me a few years ago. It’s a cute little story, and Cricket enjoyed it because it was about a dog. Country Angel Christmas – Cricket really liked this story about the littlest angels and how they helped prepare for the Christmas celebration in heaven. I thought it was odd that a Christmas book set in heaven contained Saint Nicholas, but only eluded to Jesus. The Nativity – Cricket asked for me to find this book, making me glad I had labeled them. It focuses on the different animals in the nativity story and the role that they each played. The Berenstain Bears and the Joy of Giving – I think this was Cricket’s favorite so far based on her retelling, but she read this one with Daddy (and it’s new) so I don’t have thoughts on it yet. Prince of Egypt: Dreamworks Classics Collection – This was a little long for Cricket, and not a Magic Treehouse book. So I summarized once she started losing interest. The Mystery of King Karfu – This was a perfect book for Cricket. It had enough about Egypt to be meaningful, but was also a storybook. She loved all the clues and the way it allowed her to also be an investigator. Ancient Egypt – This was an educational and factual library find, which Cricket had no interest in at all. Countdown to Thanksgiving – This book was a great math and seasonal add on. It reinforced the backwards counting we have been working on and Cricket enjoyed it. Dolphins at Daybreak (Magic Tree House, No. 9) – If you have been following our blog you probably already know that I have a huge Jack and Annie fan on my hands, but this was her favorite story yet. I think the kids riding on the dolphins pushed it over the edge! We have been talking about submarines and pretending to go undersea ever since we read this one. The Village of Round and Square Houses – This was an interesting story about a villages beliefs and how and why their people are housed the way that they are. It also led to a discussion about our beliefs, since they were not worshiping as Christians. Ashanti to Zulu: African Traditions (Picture Puffin Books) – Cricket did not want to READ this entire book, but I read the headline for each letter. We discussed the pictures and I read more of the ones that she was interested in. A Plump and Perky Turkey – This was a rhyming style Thanksgiving book and both Cricket and my husband thought it was silly (I’m not sure if they meant that as a positive or a negative though). Missing Mittens (MathStart 1) and Bug Dance (MathStart 1) – We won both of these books in the Curriculum Clean Out hosted by Homeschool Creations from the blogger troutwife . My daughter has really enjoyed these books and a highly recommend them for some basic math concepts and just a good book. Cricket really enjoyed the dance in Bug Dance!